Low Water, with the tourist track beside it, is seen here 800 feet below the viewpoint, on top of Coniston Old Man, with part of Levers Water beyond it. 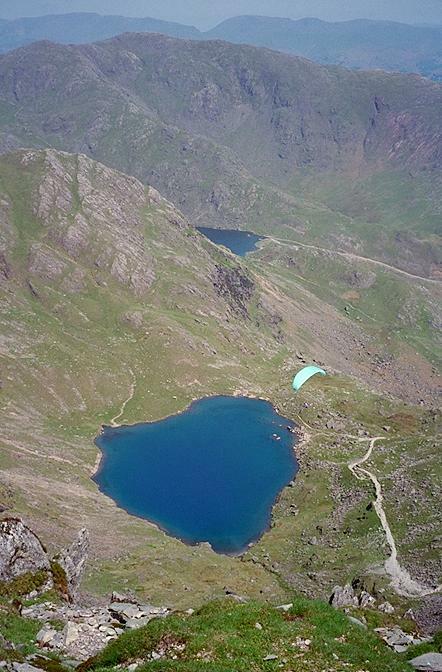 The paraglider gained height and hovered above the ridge from Brim Fell for some time. Behind Levers Water lies Wetherlam, and on the horizon from right to left is the ascent, via Great Rigg, of Fairfield, and to the left of the gap, Grisedale, is Dollywagon Pike. Smaller version of this picture.